The Red-billed Quelea range expansion in the Western Cape can now be viewed interactively online. The map shows all records reported to me as well as early ringing and SABAP2 records (but not more recent ones). These records have been imported into the Special Watch format, but details may not be complete. 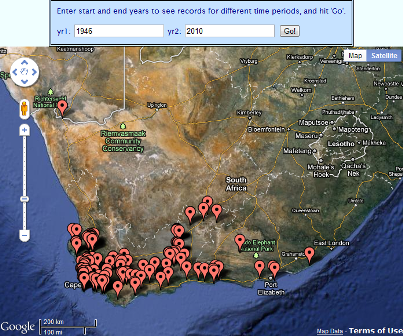 If you have full details of old records of quelea in the Western Cape, you may submit to the ADU Special Watch page. Any new records should also be submitted here, even if you have ringed it, or included it on a SABAP2 form. See the map of Special Watch records here. You can choose different years and see where quelea were reported in those years.